From the youngest daughter of a farmer family of seven children straight to Pattaya’s skillful cook and flourishing female entrepreneur, Maypriya “May” Cavin of MAYs Urban Thai Dine oversees booming restaurants scattered across Asia, namely Pattaya, Bali and Vietnam, with more to come. Her food-filled journey began with long queues of people lining up for her street-side stand in Pattaya; people obviously went wild for her magnetic cooking expertise. Many moons after, as expected, MAYs Urban Thai Dine was born. And in the city where Thai food is seen and eaten all around, her restaurant stands out due to its semi-fine dining approach. 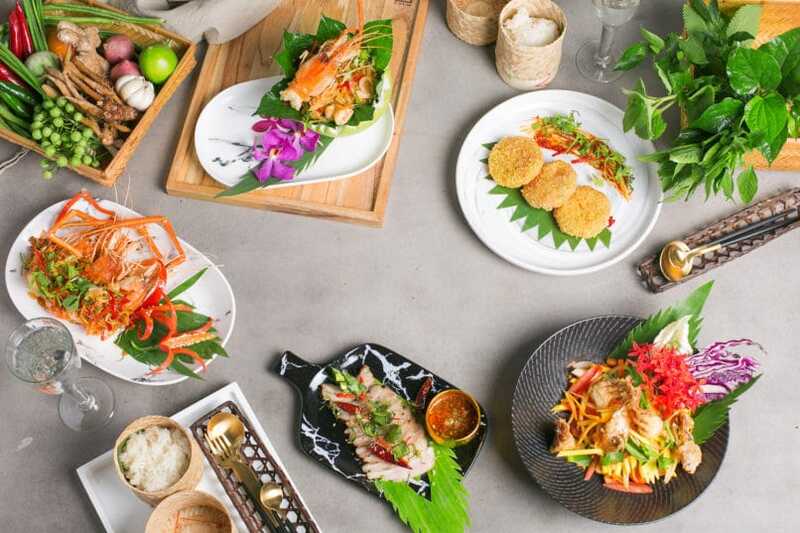 There are no white tablecloths but diners can expect wet towels, sleek welcoming drinks, Thai-inspired snacks (whatever is on the market) and Thai food represented in a fresh yet refined way. So when dining at MAYs, look far beyond the usual notion of Thai restaurants. 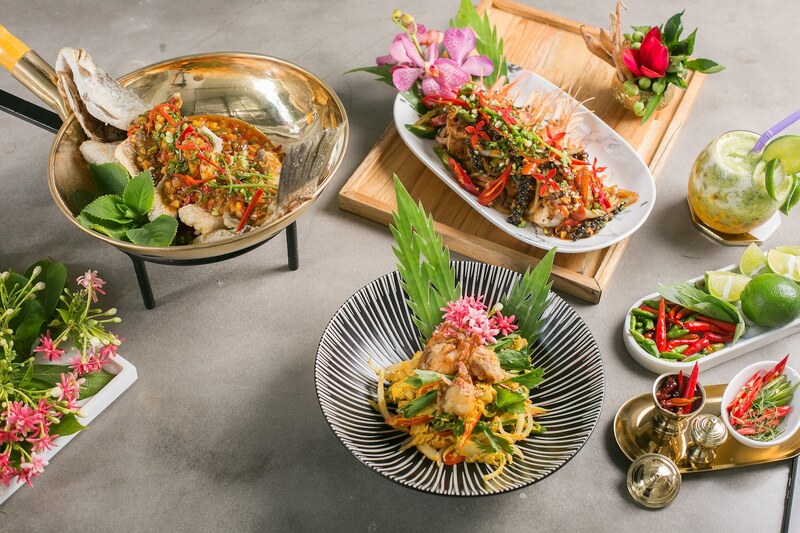 We stopped by the restaurant on our visit to the vibrant city and we’ve curated a few dishes you definitely need to try at MAYs Urban Thai Dine. Thai Shrimp Cake with Cucumber Sauce (THB 170) and Pomelo Salad with Prawn (THB 190) are two stellar starters you should opt for. The meaty shrimp patty is wrapped under the crackly and crispy breadcrumb skin and is a perfect hearty counterpart to the tangy-sweet pomelo salad dressed in ancoconut milk-based dressing. And since we are talking appetizers, you absolutely can’t forget the Chicken Satay (THB 180). 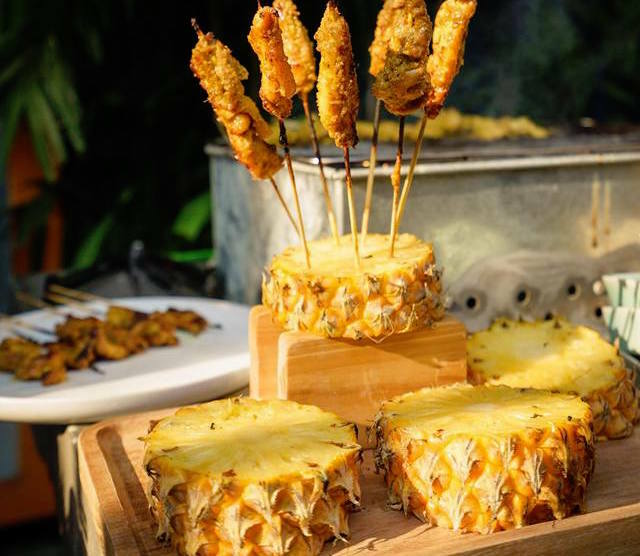 Served on chopped pineapple chunks, here’s a new cool way to have the Thai turmeric-marinated skewered chicken. And did we mention the food here is MSG-free? Well, that gives you one extra reason to dine here. Most Thai food devotees, relatively speaking, are all about that thick curry on a bed of warm rice. MAYs Urban Thai Dine serves a repertoire of mind-melding curries made from house-made curry pastes like Beef Massaman Curry (THB 450) with the medium-rare meat swimming in the marvelously thick massaman sauce; Grilled Australian Lamb Chop in Pineapple Curry (THB 450); May’s Curry with Duck (THB 380), the highlighted dish of the restaurant since May came up with the unique chilli paste to use as the base for this special curry herself. 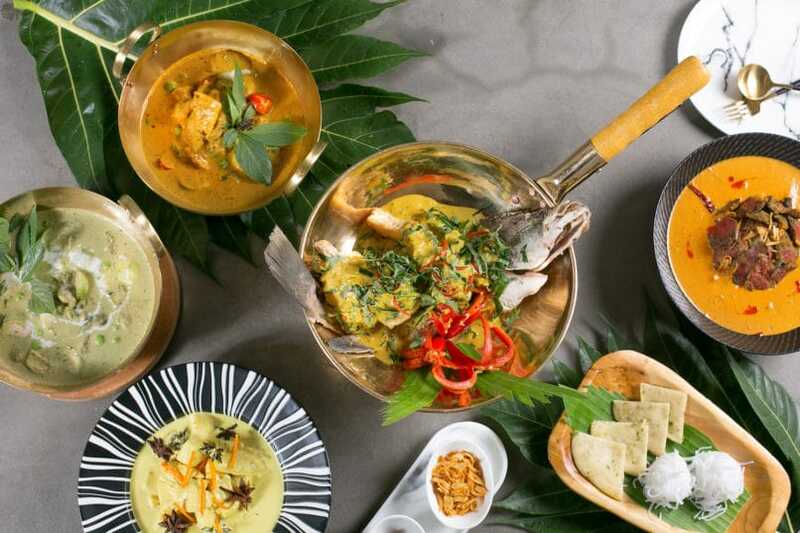 For globe-trotters who happen to visit the city and are not yet familiar with the heat of Thai food, May’s curry can also be made on the milder or sweeter side just so that it can cater to everyone’s palate. 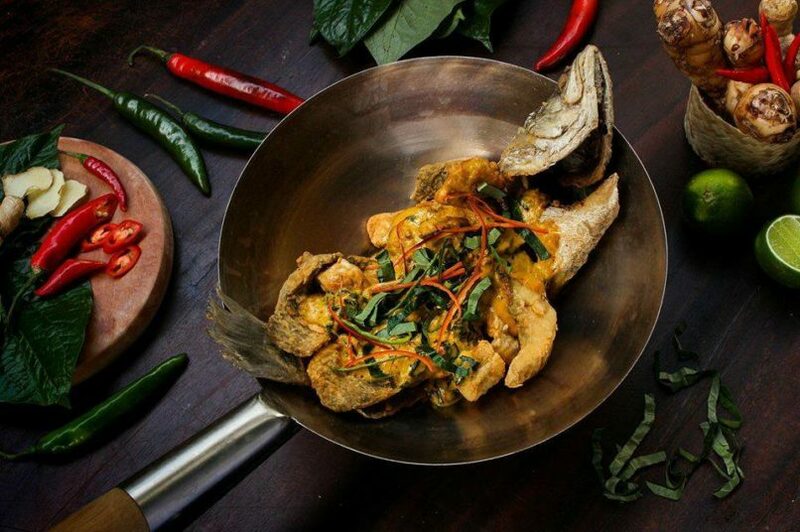 The can’t-miss curry though is the Seabass with Yellow Curry (THB 470) where the whole sea bass gets fried until the skin crisps up and the meat is cooked through but still retains its toothsome moisture. The fish then gets a blanket of chunky curry fuelled with spices like turmeric and chilli, which give the dish that pure yellowy deliciousness. One of the coolest things about MAYs is that, for every table, the cooked jasmine rice is served unlimitedly to diners for free. Using the rice and veggies locally grown in the pieces of land not far from the heart of the city, this is how May crafts her way of supporting local farmers in the area. And although the jasmine rice on its own is already impeccable, MAYs takes it up a notch with her Pineapple Fried Rice (THB 250). 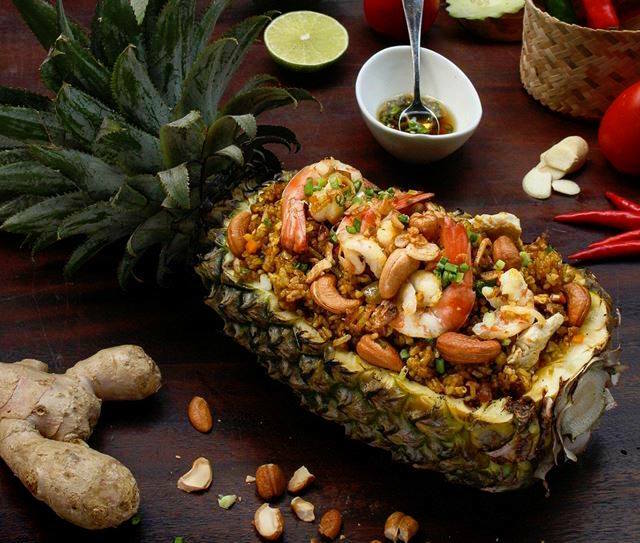 Served in a plate made from Pineapple, the rice is seasoned to perfection with soy sauce, chilli paste and pineapple. What makes this fried rice even greater is the beautiful decoration of shrimps on top, which adds a sea-enriched charm to the dish . Satisfy your sweet tooth with May’s array of traditional Thai desserts. Her Sticky Rice with Mango (THB 190) is extraordinary thanks to the added lychees that perfumes the sticky rice with its slight acidity and fruity sweetness. MAYs Mango Cake (THB 220) should also be your top choice next to the sticky rice dessert if you absolutely have that fondness for all things mango. 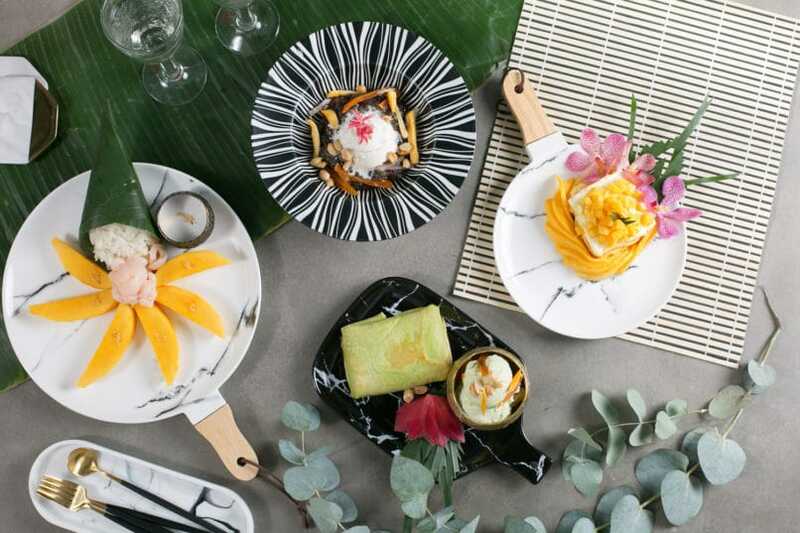 But for someone who detests fruit in desserts (yes, such persons do exist), the Coconut Pancake served with Pandan Ice Cream (THB 220) and Black Bean in Coconut milk topped with Coconut Ice Cream (THB 190) would be your sure-win choices. Open: Mon-Sun, 11 am- 11 pm.